It's that time of year again when Montreal's Igloofest lifts the curtain on its annual lineup, and organizers have now done just that. The 13th edition of Igloofest will take place January 17 to February 2, and the 2019 lineup is more than a little stacked. Over the course of nine festive evenings, the likes of Diplo, Four Tet, RL Grime, Above & Beyond, Baauer, Maceo Plex, and Polo & Pan will all make appearances. Other acts include Gramatik, Chris Lake, Mind Against, Chris Liebing, Skatebård, Nina Las Vegas, Jacques Greene, Le Matos, Eagles & Butterflies, Volvox, YOOKiE, Spencer Brown, Tommy Kruise, Ryan Playground and many more. You can check out a lineup reveal video below, as well as learn more about the artists playing the 2019 event over here. Igloofest will take place once more at the Jacques-Cartier Quay at the Old Port of Montreal. 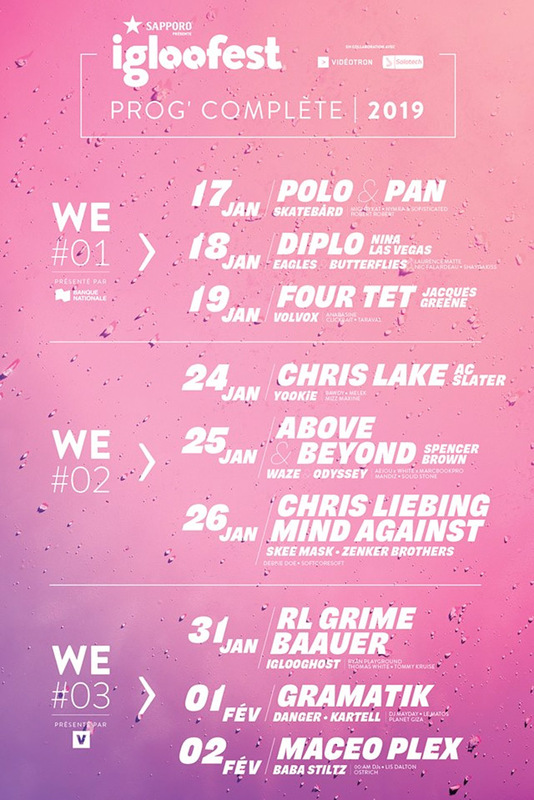 Visit Igloofest's official website for all ticketing info.